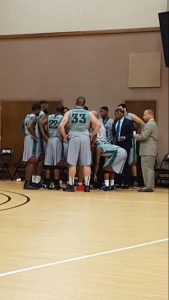 After losing a close battle on the road against Johnson and Wales University, 68-72 in the season opener, the Conquistadors defeated the Suns of Johnson University Fl. 94-72 to even their record on the young season. The Conquistadors were led by Jr. point guard Antonio Sims who scored 22 points, grabbed 3 rebounds, and added 5 assist. Senior guards Chris Hall and Jermohn Queen added 15 and 11 points respectively. The Conquistadors are about to embark on a brutal stretch of games that will start tomorrow night when #7 ranked NAIA Talladega Tornadoes visit Bucky Dent for a 7PM tip-off. They will then travel to Warner University Tuesday to battle the #19 ranked Warner Royals. Tip-off for that game is 7PM. Thursday they will travel to Keiser to face the #6 ranked NAIA Seahawks in West Palm Beach Fl. for a 7PM tip-off. 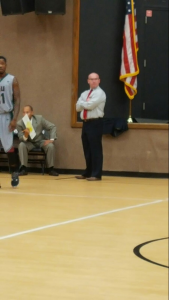 Coach Thatcher watch his troops against Johnson University Fl. The Conquistadors huddle during a timeout.